Grind the coconut with 2 cups of warm water and strain to extract the milk. Wash and soak the urad dal and parboiled rice together for 2 hours. Drain and grind to make a fine paste using the coconut milk. Put the onion, carrot, cabbage, cumin seeds, green chillies, coconut and salt and stir well. Cover and keep to ferment for at least 3 to 4 hours. 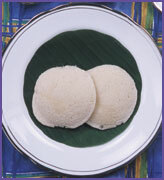 Pour into greased idli moulds and steam for at least 10 to 12 minutes.